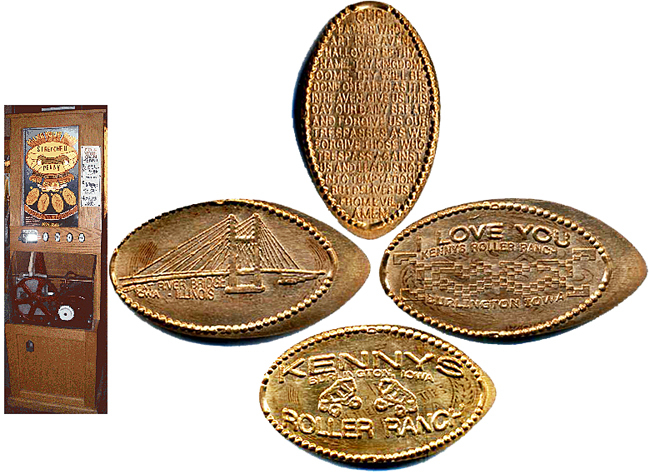 The Penny Machine is located inside the entrance gate near by the front door s when you go in to Roller Skate at Kenny s Roller Ranch. It is FREE to go inside to make your 4 Collecter Penny s after you asked the Owner to unlock the entrance gate to get inside. But if you want to Roller Skate you have to pay. The Hour s are (Fri s 7 P.M.-10:30 P.M.), (Sat s 2 P.M.- 4 P.M. and 7 P.M.- 10:30 P.M.), and (Sun s 2 P.M.- 4 P.M.).